I'll Never be without my Banks Exhaust Brake! Without my Banks exhaust brake and banks exhaust system, starting down a 7% grade, with that heavy Fifth wheel chasing me, used to be a knuckle whitening, eye bulging, heart pounding ride for your life! I thought RVing was supposed to be fun?! Which was going to run out first, the hill, the brakes, or my heart? That ol' diesel roaring down the mountain like an 18,000 Lb. bowling ball was kind of like stepping off a cliff and praying it wouldn't hurt too bad when I hit the bottom. Not exactly a pleasant way to travel! With the truck stock, the way I bought it, there were only two options. Both were lousy alternatives. Either I could run down the grade in a gear that had me on the brakes so much, that it had me praying they wouldn't cook before we got down the hill, or, I could gear down so low I was scared I'd get run over by everybody else trying to roll down the mountain behind me. Even then I had to use the brakes way too hard. I just knew I was going to get kissed in the tailgate by another rig that had even less control than I did. An introduction I would rather do without. Going downhill was about my only displeasure with the rig and I was really unhappy with that! I knew about diesel exhaust brakes and engine brakes from the big trucks we had around the ranches. 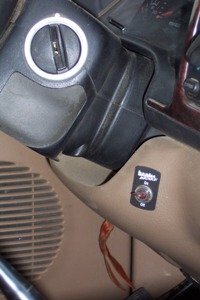 Just took me a couple years to discover they (exhaust brakes) were also available for the diesel pickups. Didn't take long after that to get one put on the Cummins! I did a lot of reading and opted for the Banks exhaust brake, accompanied by the Banks exhaust system. I felt it to be the best engineered on the market. It was installed in June of 2004 just before a long summer’s journey through the Pacific Northwest and Montana. Our first experience with its performance was an hour into the trip, just west of Cheyenne. There's a sharp grade there of approximately 7% as you roll toward Laramie on I-80. I'd been down that mountain previously without the exhaust brake. Let's just say it had been one of the least pleasant parts of those trips. Needless to say, I was a little apprehensive as I topped out and started down. It'd always been a brake "warming" exercise in the past. I pulled the 5 spd. down into third gear, winding it up to 2500 rpm. or so. I was hoping I wouldn't have to drag it down into second and do the "RV crawl" down the long grade. But that was before the Banks exhaust brake! Not this time! Whoooee! My grimace quickly transformed into a silly looking grin. My wife claims the grin swelled into a goofy giggle! But I won't admit to that! 3rd gear was too darn slow! I actually had to give her some throttle to keep from slowing down! In short order I up shifted to fourth! On a 7% grade! Never touched the service brakes from the top to the bottom! Sweet! That Banks exhaust brake held me to a reasonable, comfortable, relaxed and very controlled descent of the mountain. YES! The terror of a mountain grade? Gone! The white knuckled, eye bulging, bowel churning ride? History! Oh yeah baby! Gale Banks is a genuine western hero for this old hand! Going down hill now is just another pleasant day on the road, lost somewhere in the west! The only place I need to use the service brakes on descents now, is if the road speed is down to maybe 35 mph. on a real heavy grade. Then I just pull her down into third gear and break to hold her below 2800 rpm. Usually only two or three applications gets me down such a slow, heavy grade. No sweat! I love it! One grade in southern Oregon was 25 mph. and twisted up like a can full of worms. I did get down into second there but it was 8%! I leave the exhaust brake on all the time. It engages anytime I come off the throttle above 30 mph. and disengages at about 15 mph. So around town it saves the service brakes, extending their useful life! And that saves precious dollars! It just keeps getting better! Only time I turn it off is if conditions are real slippery or I want to be able to coast for some reason. The whole Banks exhaust brake and 4" exhaust system may have cost me $1,800 bucks +-, but they are, by God, worth every penny! Banks power brags that the combined systems will also increase power and fuel mileage by approximately 10-15%. Sounds like a bunch of marketing hooey don't it? I thought so too. I figured the exhaust brake would work but the other claims I simply discounted. Pure marketing BS for sure. My previous best fuel mileage (pre Banks exhaust brake / Banks exhaust system) running empty (no trailer) was 21.8 mpg. With the Banks installed it jumped, at sea level on the Olympic peninsula, to 25.4 mpg! That’s right, not a typo! I said 25.4 mpg! That’s running 55-60mph on 50+- mile runs. I'm running 3.73 differentials with a 5spd manual transmission behind that good ol' 4wd, '98 Cummins diesel. I didn't dyno the rig before and after the installation so I can't give you those exact numbers either, but if I had to guess, I would say the combination of the Banks exhaust brake and the Banks exhaust system kicked in at least 25 more horsepower (probably over 30). It seems the system reshapes and improves the exhaust flow when the exhaust brake is not engaged yielding the increase in power. 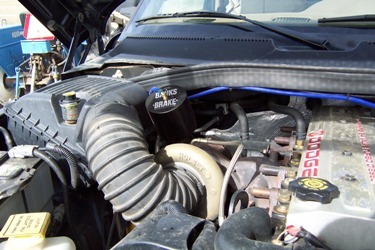 I know I don't have to downshift on some grades where I used to before the Banks exhaust systems were installed! Though the Banks exhaust brake is probably the highest priced unit on the market, in my experience it is the best designed. They make the brag and then fulfill the promised performance. So, in my opinion, it is the best value for your dollar. The other brands of exhaust brakes work as well, I expect, to slow you down, but none of them that I have been able to find, also add power and reduce fuel consumption like the Banks exhaust brake design. Two years in my own truck has sure proven it for me. For me it is worth every penny for the safety and peace of mind it delivers. Not to mention the increased performance, and the reduced brake maintenance! If you are pulling a heavy trailer, you need an exhaust brake! For this RV boondocker it will always be Banks.